day 304 and this is a day which has become a bonus. i have an amazing friend who is also an awesome artist. 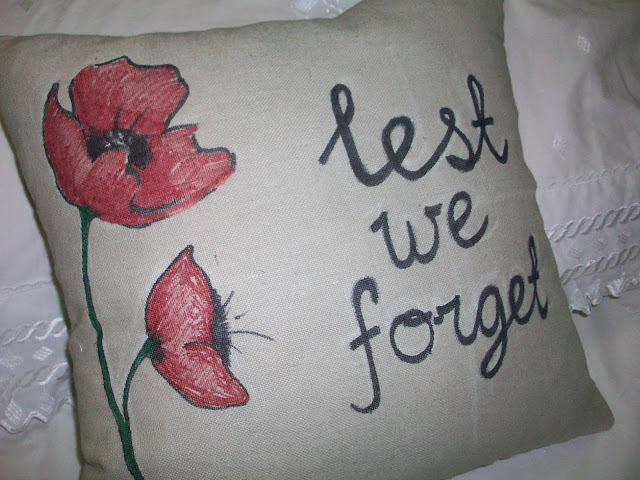 today i had some stencils out to make the first of a couple of pillows for ANZAC day. ANZAC (Australian New Zealand Army Corps) day is a national holiday in new zealand and australia to commemorate those lives lost serving our countries, lest we forget. lana, luckily offered to help ... seriously i was never going to say no and handed the materials over to her for the project. 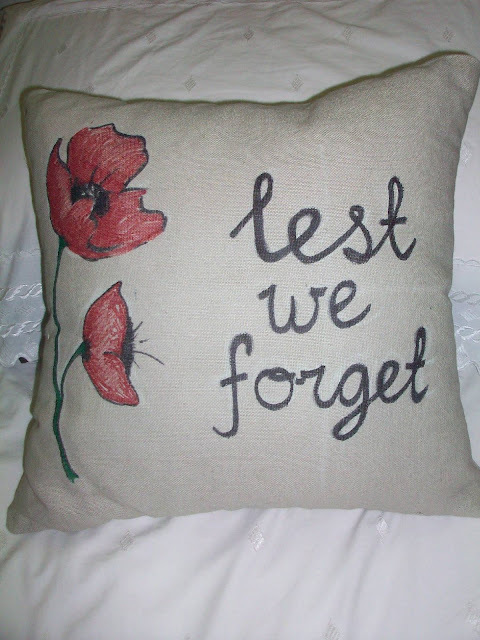 for today's pillow, i purchased this cotton ready made pillow for $5 (loving the versatility of this cheap pillows which are just perfect for embellishing) which is cheaper that making a cushion from scratch ... i kid you not. 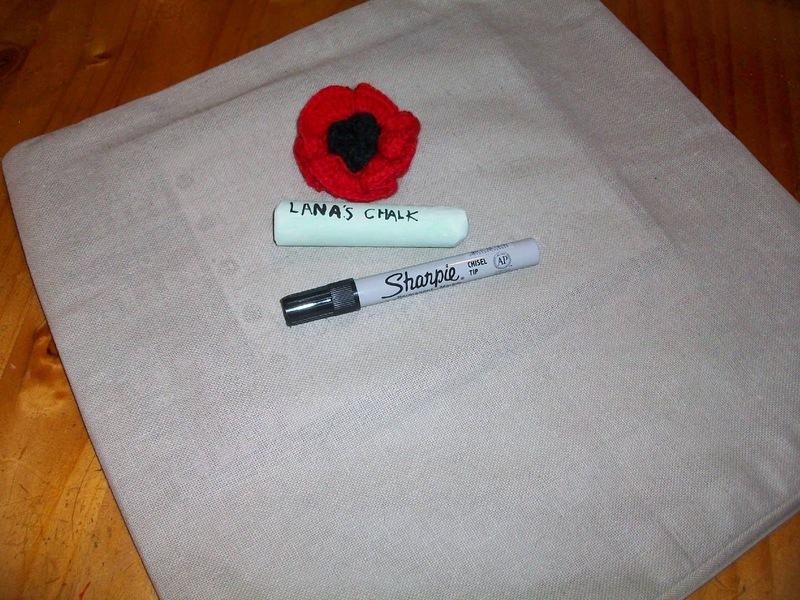 photo of the materials, remember to put something inside the cushion cover to stop the permanent marker bleeding through to the other side. the crocheted flower was given to me by a dear friend and i was going to use it on this cushion before lana volunteered to help with the artwork! 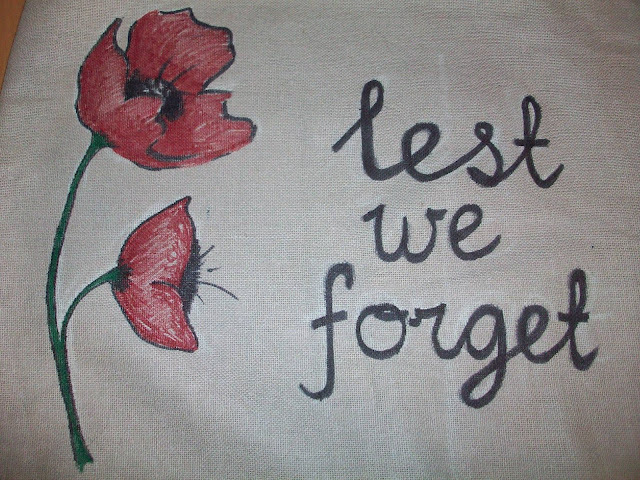 lana used chalk to mock up some poppies (our national symbol of remembrance for ANZAC day) and the words before commencing with the permanent markers. she used this watercolour, available from dreamstime, as inspiration for the poppies on the pillow. the artwork is available for download and it is definitely a favourite of mine with regards to poppies and something i will buy and get a canvas made from. my sincerest thanks to alana for creation this pillow for me while all i had to do for today's creation was provide the materials and my lest we forget pinterest board for inspiration ... love you. thanks also goes to dreamstime for buying the copyrights to such outstanding original artworks and making them available at attainable prices ... awesome! We all need a Lana in our lives! That poppy image is gorgeous and it's a perfect tribute for ANZAC day.